New head coach, same opportunistic Chicago Bears defense. The Bears forced three first-half turnovers and linebacker Jonathan Bostic returned an interception 51 yards for a touchdown, but the Carolina Panthers spoiled Marc Trestman's NFL head coaching debut with a 24-17 win over Friday. The Bears — who had four turnovers — picked up where they left off last season when they led the NFL with 44 takeaways and finished with nine defensive touchdowns, one shy of the league record. "Certainly we didn't do what we wanted or up to our expectations," Trestman said of his offense. "... We've got work to do." "Defensively, we just wanted to go out and establish ourselves," Panthers linebacker Thomas Davis said. "We didn't really know what to expect because everything is new in Chicago. So it was all about going out and executing what we do and we did a good job of that defensively." "Cam got a little greedy and tried to force the ball in there," Panthers coach Ron Rivera said. The Panthers tried to emphasize their push toward a "more traditional running game", but struggled to move the ball with DeAngelo Williams held to 10 yards on five carries. With running backs Jonathan Stewart and Mike Tolbert out with injuries, the Panthers got a long look at their three young running backs — Tauren Poole, Armond Smith and sixth-round pick Kenjon Barner from Oregon. "That's unacceptable," Barner said of an earlier fumble in his NFL debut. "I can't have that. In no way, shape or form can you win games with turnovers. I've got to get that corrected." "I'm calmer this time around as opposed to my rookie year," Norman said. "I have to put the ball on Alshon's (Jeffery) other shoulder," Cutler said. "We had some good stuff after that; we had some bad stuff. Typical preseason game." 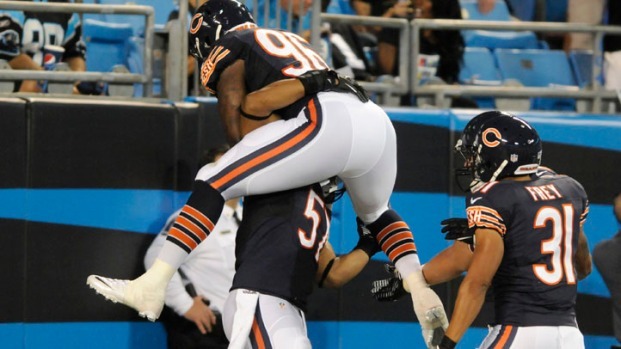 "There were a lot of things we could do better," Bears linebacker Lance Briggs said. "There were some things we did well. When we put on the tape, we'll all evaluate the things to improve on. All in all, when you are getting turnovers in the game that's very big."